House Hunt Victoria: What bottoms look like. According to Roger's rent vs buy calculator, if it stays flat, we break approximately even and can afford a better place in a year. If it declines we save whatever the decline was. This implies that for your target property ownership costs are about the same as renting, which sounds unlikely. Could you tell us what the property would sell and rent for today? Also the median price seems to have exaggerated the bounce from the bottom for Seattle (which it often does in the short term). The aggregate C-S fell 34% nominal off peak and is now about 27% off peak. 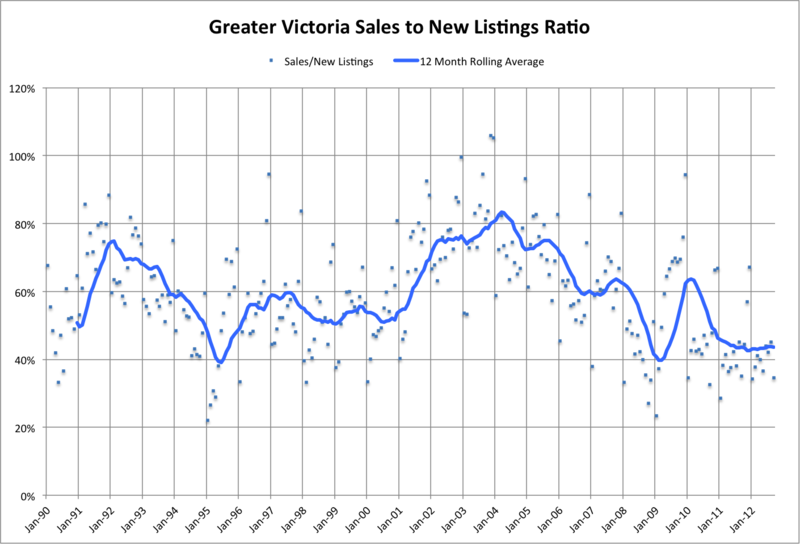 Note that yours truly uber bear is predicting 25% nominal off peak for Victoria. Again thank you for the fine graphs. Well, congrats on the decision Leo. Must be a relief not to be on the fence for a bit. For what is is worth in predictive backup power, I agree with you on your views of market conditions. Your graphs are great. Based on current economic conditions and interest rates I don't see the market rising - despite the CMHC quarterly report saying it is likely that prices will rise a bit in 2013. I also don't see them falling steeply. Rising listings and fewer sales affects consumer confidence. 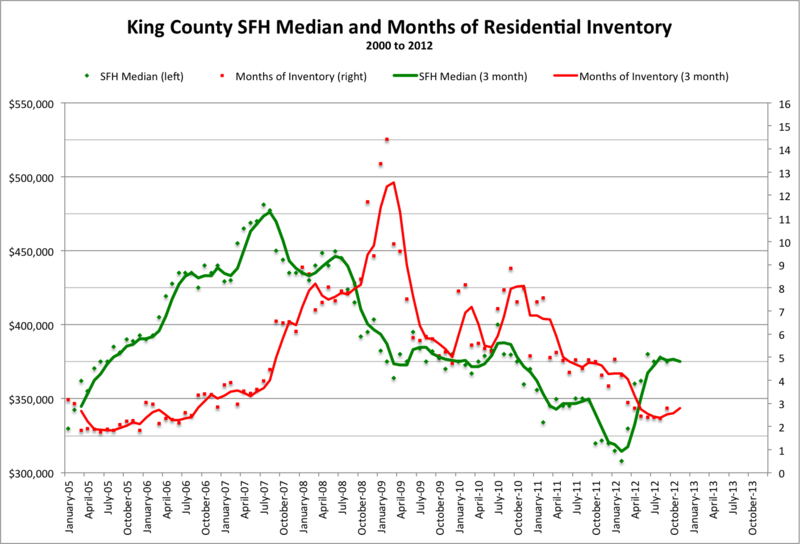 Local consumer confidence is also affected by all those stories out there about Vancouver's market stalling. A drop in consumer confidence will likely gradually affect prices and what some sellers will accept for their properties after they have been on the market for a time. Also, all the comments on PCS changed my mind on signing up. I feel better knowing that it is not taking advantage given that I may buy a property that is listed by a realtor. As an interesting aside, a friend just relocated here from Regina. She had bought a condo in Regina for $399 000 in January and sold it last week for $510 000. Yes, $100 000 plus in ten months. Had no idea they had an economic boom and housing shortage going on right now. Finally, Patriotz, may I suggest you change your id to "uber bear"? I was kind of afraid to look at the images accompanying this post. Totoro - I am an bit of an ox, so I am always invited to all my friends' moving "parties". I actually love moving day, so much excitement setting up a new home - lots of work, but I always go to sleep with a smile on my face (rarely on a set-up bed). Moved a lot of times in the past six years - five houses. Moving is an art, especially with as many kids as we have. This implies that for your target property ownership costs are about the same as renting, which sounds unlikely. $1850 rent, $550,000 house (well, house was cheaper but I'm adding the cost of the immediately necessary repairs to purchase price). We're renting almost the exact place that we would have bought, so it's very comparable. To be conservative I put in very low returns for our down payment into the calculator (1.5%). Future price stays the same, interest rate stays the same. @simpleman I was kind of afraid to look at the images accompanying this post. I actually love moving day, so much excitement setting up a new home - lots of work, but I always go to sleep with a smile on my face (rarely on a set-up bed). Yeah! Moving is supposed to be stressful, but I like it. Sure some of it is annoying (changing addresses), but I enjoy going through my things and throwing out/donating the stuff that I haven't used since the last move, and then the excitement of being in a new and better place and back to a neighbourhood that we prefer. First time living in a house, so I'm looking forward to having a garage and not having to go down to the storage lockers for everything. When I bought in 2003 I had to laugh when an agent told me to hurry because " he was signing deals on the hoods of cars"
Even at 3% your capital costs alone almost equal rental value. That's a price/rent of over 300, every market in the US (including Seattle which hasn't come down as much as some) is below 200 AFAIK. That $550K house will cost you another $450 per month in TIM: property Taxes, house Insurance, and basic Maintenance. Was this factored into your decision? Basic maintenance costs about $175/month and covers things like flooring, furnace/heat, water tank, any fixed appliances, minimal paint to exterior or interior ... the things that you might call the landlord to fix. I am using Roger's wait/buy tool. It takes all this into account. The breaking even happens if prices in a year or two are still exactly what they are now. I fully expect prices to decline, but I've been looking at this long enough to have a healthy uncertainty about what will happen, so I wanted to make sure that even if prices don't decline we wouldn't be making a mistake by waiting. You live in the same house while the home owner shoulders all the risk. Renting is coming back into vogue. Sure these are fixer uppers but then the assessed values are insane. Brilliant. I like how there was not a word lost about return on investment. Who cares as long as the rent "probably" covers the payments on the investment properties. Everyone knows there are no other costs to owning a home. Ohwell the nice real estate professionals said it was a good idea. Cash flow schmash flow, 3 properties is better than 1. Investing advice from a realtor and a mortgage broker. Gotta love the graffiti on the second home in North Saanich (MLS 316012). I'm guessing that it has been vacant for a long time. Tony Joe and the power of leveraging! Note that the purchaser has been paying fairly high interest rates in 2003 (4.6%) and also when renewing in 2008 (5.65%). The owner has paid much more interest than was needed, suggesting that either they didn't have good credit or that the featured mortgage broker was not doing her job. I know this for fact - as my variable interest has fluctuated between 1.45% and 4.40% over the past 10 years, and is currently 2.40%. This means that I currently pay 3.25% less than this mortgage holder, such that I have paid off much more principal. My significant other and I have a competition to find the lowest price to assessed ratio. Do you guys have lives? Gotta love the graffiti on the second home in North Saanich (MLS 316012). Yikes...I wonder what they say?! I gather that there is an "Order for Conduct of Sale" for this property. By this stage, the owner is typically a year or more in arrears. I'm sure other bloggers can explain further - as I'm no expert. She should buy 5 of those250,000 dollar condos with her 268k equity takeout (50k down on each condo) like the video suggested she could. That way she can lose another $3500 per month ($700 on each condo), to add to the $700 per month extra she's paying on the home equity takeout to fund the condos. Then to top it off, she loses another ~$10,000 per unit in selling costs a year from now, when she wakes up to the negative cash flow. Not to mention at least another 5% decline in value, or $12,500 per unit upon selling. Grand total loss of $162,900+ in one year, assuming she's able to quickly pass the falling knife. Listening to realtor & mort broker videos telling you it's a "great investment," priceless. I agree, that video is really, really, misleading. My significant other and I have a competition to find the most houses with beige exteriors on MLS. So far I'm winning with 347. Those with less than 20% down are getting squeezed by mortgage rule changes. As Tony Joe said at the end of the video. It's all about net worth. If the person, in 2008, used their home equity as a down payment for either 2 homes or 3 condominiums what improvement has been made in their net worth? If that person woke up, this morning and said, "Sell everything!" Would their net worth be more or less if they had bought their investment properties after 2008? And that is the crux of the difference between bears and bulls. The bulls say. "look it worked for me in 2003" And the bears say "but it won't work today"
Introvert's bitterness will now be directly proportional to the decline of his/her home value. How much has Saanich East declined? Beats me. Imagine my bitterness were I to live in Sooke! koozdra, why don't you get back to doing what you do best: posting millions of links to MLS listings. Thank you for the personal welcome. I'm a math and grammar nazi, for the record! But I usually keep it to myself. Which canuck property would you choose to invest your $270,000 home equity - Option Youtube or Option Z? As the realtor showed, you can buy $1,340,000 worth of property with your home equity. Bonus question: Do you think the realtor would really put his money where his mouth is and choose Option Y for himself? I think you make a good point. For purely investment purposes there are better places to make money in Canada than Victoria. Of course, you'd have to factor in property management costs and want to enter this kind of investment in the first place. Do you have the ability to delete posts or is that restricted to HHV? The personal attacks are really starting to detract from this blog. As am I, as my job depends on me being so. However, on a blog that I type out quickly between tasks, it is nice to let loose a little. I think people get the intent of postings even if there is the occasional grammatical or spelling error. I know there are a lot of posts I hit publish and immediately see a mistake, but have no way of correcting. Let's all drop any personal jabs and stick to the topic - yes? 9:40 in Jim Flaherty says that we were running the risk of having a Spanish, Irish, United States boom that would go bust but carefully states that we have avoided it. Will Canada be the first country to engineer a soft landing? F is the same minister that said we would not be a victim of the 2008 recession and was on the helm when Canadian banks were silently bailed out for $111 Billion thereafter, while he was trumpeting all around the world about how our banks were different and how everyone should listen to their fiscal advice. I am sure there is much we do not know, yet. Excuse me if I don't feel like I can believe everything that comes out of his mouth. I do not. I only have submission rights for articles. Flaherty: "Canada has done enough to cool the houseing market." Maybe (a big maybe) people will have to take full responsibility for their actions in terms of buying real estate from now on. For purely investment purposes there are better places to make money in Canada than Victoria. Which is why prices in Victoria will have to go down. The smart money will go somewhere else. Leveraging is a great concept in theory. But in reality nobody borrows at the bottom of a market, when you are supposed to. People tend to borrow and magnify gains only after a market run up (equities, bonds, RE take your pick). Leveraging at the top of a market is too common and often results in magnified losses. People should have leverage into RE 10+ years ago when it was a dog with fleas and into equities in Mar 09. The reality is hardly anybody does because most are too fearful. As Buffet says, "Be greedy when people are fearful and be fearful when people are greedy." I think Mr. Joe is one of the latter. When RE smells like equities in Mar 09, I will be buying (again). But in reality nobody borrows at the bottom of a market, when you are supposed to. Well of course somebody does. A recent sale on westdowne - can anyone tell me how much it sold for? @simple man Your sales disappear from PCS immediately now? Sounds like it's time to get a different account. I am not sure when it disappeared, but it is not there now am I know it sold. I guarantee if we were in a market like two years ago when houses were selling in bidding wars above asking all the time, we would have full access to all the data. Now that the market is turning hard, seems like it is awfully hard for me to get the basic data. If you gave us an MLS number or an address it would be easier to look up the sold price. @simple man. My PCS still shows all the regular data. Maybe it's just not updated yet but might be worth requesting a different account from another realtor. Yowza! No a sign of collapse there. thanks Marko - median is holding, sales volume low. 76 sales last week - I don't follow weekly volumes much, but that seems very low. The number of new listings appear to be "on target" to match last year, while the sales volume is down about 25% to reach ~350 sales by the end of the month. I certainly don't see any reason for you to hurry. The only thing I would worry about is if a house you want, in the area you want, for a price you see as reasonable comes available. There is an argument here for further tightening for the mortgage market, as the market could be expected to return after 3 - 6 months because of continuing ultra low rates. I personally believe this to be true. Our market "returning" is as you say a halibut, and not the increases that have been tracking on the national market. So the risks to you are that this could be a buying opportunity where you could get a low ball in vs the possibility of further price drops. I certainly don't see any reason for you to hurry. The only thing I would worry about is if a house you want, in the area you want, for a price you see as reasonable comes available. For sure. We didn't walk away from our offer because of the potential of future price declines. We walked away because after thinking about it in more detail it wasn't quite the space we wanted/needed. There is an argument here for further tightening for the mortgage market, as the market could be expected to return after 3 - 6 months because of continuing ultra low rates. I personally believe this to be true. This could very well be. Currently we are in a pretty serious buyer's market because of the overhang from the changes. I wouldn't be surprised if it balances out a bit in 6 months once people have adjusted to the changes. We really should be seeing some price drops by that time though. I can't imagine Victoria sustaining these levels of MOI with stable prices. Good to see you back, omc. If even for a brief visit. SFH, minimum 2 beds & 2 baths, priced between $375K & $775K in the areas of Vic,OB,Esq,SE&SW. So average price this year in the same week is down $19K. 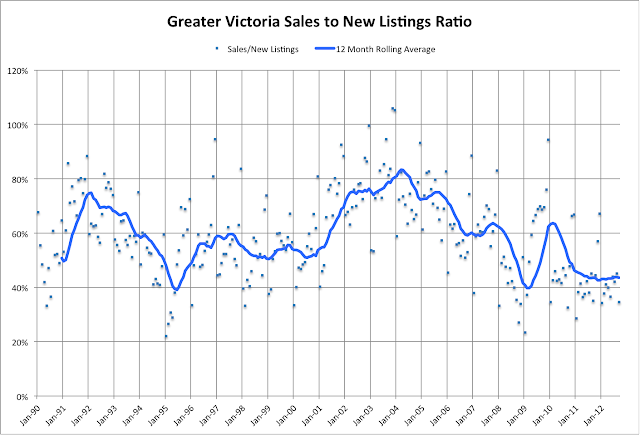 No houses sold in Gordon Head, Mount Doug or Lambrick Park areas last week and only 2 have sold in the past three weeks with available inventory of approximately 44. Eight out of the 16 sold went for below BC Assessment and 8 had disclosed secondary suites. For condos and townhomes, pretty well in the same areas, min 2 beds & 2 baths, priced between $248K & $550K, my pcs shows only four sales, one each in Esq,Vic,Vic West and SE. The avg price was $351K and med price was $373K. Three out of the four went for below B.C. Assessment. Only one townhouse sold for $403K. This time the housing market will not suddenly and magically rebound the way it did in 2009. Do any of you remember the crash of 2008-2009? It took dramatic, unprecedented, emergency intervention to turn that around. There will be no intervention of that sort this time. 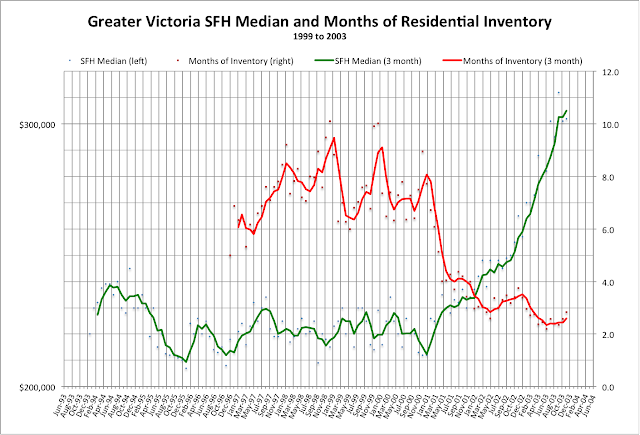 If you are thinking of buying a property in Victoria, wait it out for at least 2 years and let the majority of the correction/crash play out, this time without intervention. The big picture for Canadian real estate over the next number of years is the tightening of credit and falling prices. The house price may be going down in the next 5-7 years, slowly. The question is when you turn over 35s, how many 7 years you will have in your life? Another simple fact, most home owners will not undersell their houses unless they cannot financially afford it. If that happens, it basically means the Canadian economy crashes, and how can you guarantee that you will be financially better than others that time? The house price may be going down in the next 5-7 years, slowly. Rapidly for the next yr or so, and thwen slowly for 3-5 more years. The question is when you turn over 35s, how many 7 years you will have in your life? In Canada, on average, about 6.5 more 7-year spans. Would you rather overpay for those seven years than save money and rent to buy a better place when prices correct? Another simple fact, most home owners will not undersell their houses unless they cannot financially afford it. Exactly. 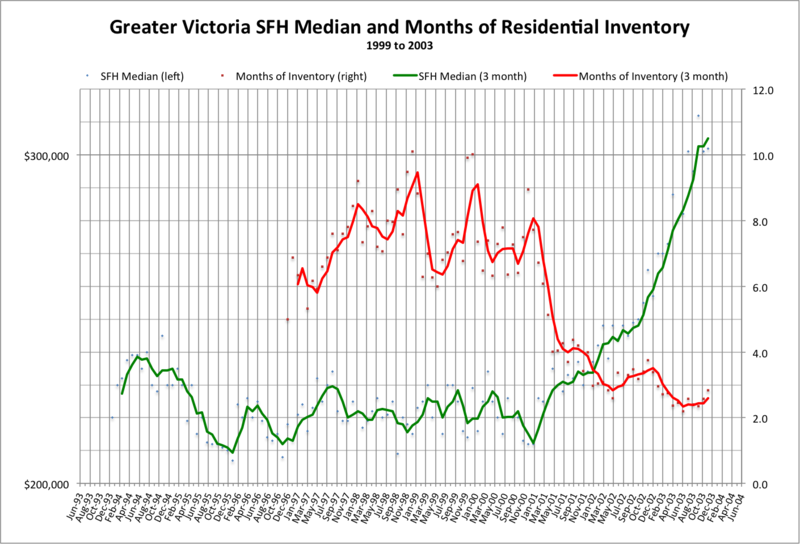 no-one wants to sell their house at a loss, although it is happening today in Victoria. If that happens, it basically means the Canadian economy crashes, and how can you guarantee that you will be financially better than others that time? Because you bought the largest purchase of your life in a trough, not at a peak.